My friend Abbie is DIY genius. She has a talent for taking plain or disparate materials and creating gorgeous art, practical items, and inventive objects that catch the eye. One of the first things I remember talking about with her was the mini-conversion she did for her station wagon to make it more of a “camper”. She sewed curtains and put them up for privacy, had a bed in the back, and even had a water rig she could use outside the car to wash dishes. I love hacks like this because it takes all the guesswork out of camping — even with inclement weather. And apparently this isn’t just popular in North America – there are people all over Europe converting their vehicles into “microcampers”. 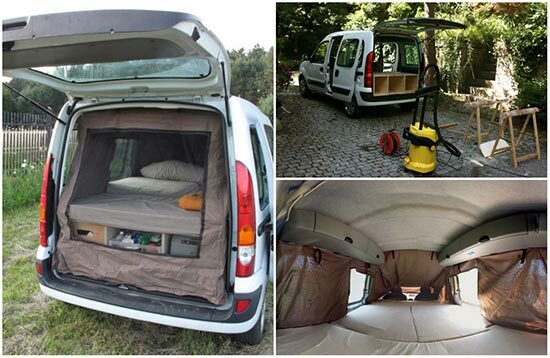 D. Textor posted his own version of the “microcamper” on Instructables, complete with step-by-step photos of everything the project entailed. The end result is impressive, especially since the vehicle he used, the Renault Kangoo (the Renault version of a mini-van), is so fuel efficient. The camper part can also be taken apart so that the vehicle is usable during the week when running errands, going to work, or picking up the kids from school. The first installation is the “Backside Box” which is perfect for storing items such as shoes, hiking gear, your cooler, and kitchen items. It’s the width of the vehicle, which means plenty of space, but narrow enough that it doesn’t take up a lot of the room that will be used for sleeping space. The “Frontside Box” fits snugly between the back box and the driver’s seat, with enough space to pack an entire closet of clothes, should you wish. Both the boxes are low enough so that the mattress you’re using can be placed atop them to make your bed. Depending on how much work you want to do, you can simply put a mattress and some egg crates on top, or you can cut up a mattress to make putting up/breaking down the camper easier on yourself. There’s also instructions on how to make thermal screens and an inner tent so that you are protected both from the sun and from any bugs who’ve decided you’d make a tasty meal. However much you want to add, you can, but you can also interpret this design how you will and create elements that fit your specific vehicle. Just make sure you measure accurately and sew carefully. There is nothing more frustrating than coming up with a good idea and then not being able to execute it correctly. If you know expert sewers, DIY-ers, or engineers, ask them for their opinion or even time – maybe they’d enjoy a camping weekend away as well. If you want to see the full conversion and DIY processes done by D. Textor, you can do so at the Instructables site. There are updated how-tos, plenty of photos, and a new post about another conversion done after the loss of Textor’s first vehicle.